Our entire life is struggle. It could take form of a simple fight on the boxing arena or be the struggle for daily bread (or vegetable) in the Soviet times when, after a long standing in line at a greengrocer, accompanied by cheerful songs from а loudspeaker, they always strived to short-weight you on the rinky-dink dirty scales with rusty weight pieces. 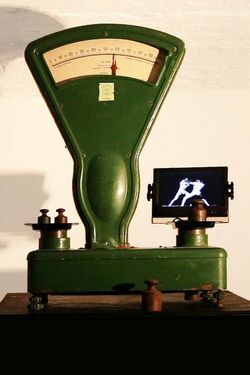 In this installation, a viewer is given an opportunity to take the situation under control – by moving weights from scale to scale, to change the song, to reach a desired balance and even, possibly, to come off victorious out of the fight with the vendor who, with each withheld gram, undermined the struggling Soviet consumer.